Karrie Kern, Chief Executive Officer of the United States operations branch of the Zimbabwe Conservation Task Force watched a hockey match in which the team was playing. 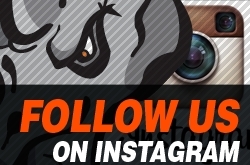 Admiring the picture of the rhino on the bodywork of the bus, she jokingly suggested the El Paso Rhinos adopt Tatenda, an actual rhino in Africa, as a mascot. 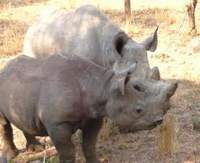 The organization followed through on Kern’s suggestion and adopted the male rhino in 2008. Though he was not physically moved to America, the organization contributed to Tatenda’s food and upkeep expenses until he was old enough to assure his own maintenance. 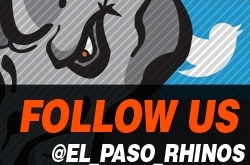 Below are letters of correspondence between Tatenda's caretakers and the El Paso Rhinos Organization. We are most honoured and grateful that the El Paso Rhinos hockey team has offered to adopt Tatenda. This is truly a wonderful gesture. As you probably know, the black rhino is an endangered species and it is extremely important to preserve the few we have left. 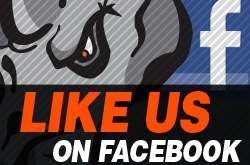 The figures Karrie sent you with regard to his feeding expenses are correct so anything you can do to help would be greatly appreciated and of course, the El Paso Rhinos will be publicly acknowledged, not only through our mailing list which is huge, but also, whenever we send out reports, they are posted on several websites around the world. 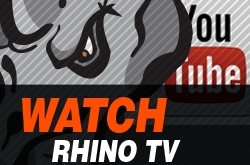 There is video footage of Tatenda on Safari Talk and YouTube, to name a few. With regard to the film footage, I'm not sure how to get this to you. I can't really do it by email because our network is really bad here in Zimbabwe and my computer is not capable of sending video footage by email. I can put all the footage on a DVD and post it to you. I will forward some of our reports and photos to you, starting from how Tatenda became an orphan. Once again, our heartfelt appreciation to you and your team for this wonderful offer. Oh brilliant Johnny! That’s just fantastic that the El Paso's will pay for Tatendas upkeep....that's just wonderful! Oh and what a pleasure having the camera, great shots! Thanks so much for sending! That’s put me in a good mood for the rest of the day! Still doing a fantastic job there as usual! Thank you for including me in your newsletters. I have fallen in love with this “love triangle” of yours! 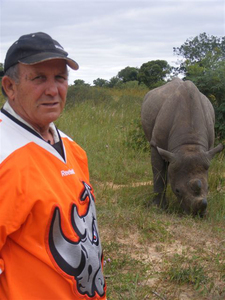 The El Paso Rhinos Hockey team has a new fan here, and I will be checking out their web site, and “pushing” their reputation across to all our world and USA visitors here at the Ocean Watch Guest House in Plettenberg Bay, SA. If any of the team ever visit this part of the world, we will discount their stay with pleasure. 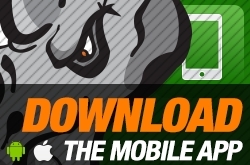 GO THE RHINOS!!!!!! 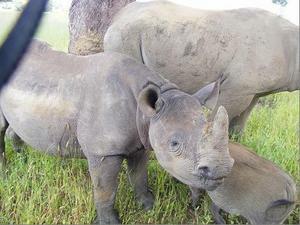 So few people realize the significance of saving even ONE Rhino, and even more importantly getting them to breed and ADDING ONE Rhino to the very low population world wide. Keep up the good work Johnny and team. We will contact you before our next visit to Zim to visit family. I think it was such a pleasant read to see how well the little rhino is doing and for the kind sponsorship by the hockey team - shows you there are still people in the world who havn't written Zim off completely! Regarding the article on the wildlife art, it will be going on sale at the end of this month - 24 to 29 November. I'll be sure to try to send you a PDF of the pages or give you a link so that you can use it as advertising on your website. I sincerely hope that you guys are kept busy this festive season with paintings galore and that that will translate into a great Christmas for the wildlife! Thank you for this wonderful report about Tatenda and Shanu. Their "first kiss" is so adorable and it's true, a picture is worth a thousand words! I loved seeing Howash with Tatatenda and Shanu and Tsotsi too! Also, seeing a picture of you with Tatenda and Shanu in the bush was great too! 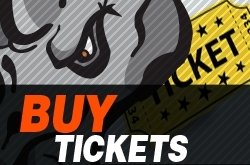 It is terrific that Tatenda has been adopted by the El Paso Rhinos Hockey team becoming their new mascot! Do you think they will put a picture of Tatenda wearing skates and a helmet on their uniforms! Most especially of course is that they will be taking care of food costs and Tatenda's ongoing needs which is absolutely remarkable Johnny! I am very thankful for this gesture on their part. I also appreciate the links to their website to view videos of Tatenda! Take good care Johnny and BIG HUGS to Tatenda, Shanu, Hogwash, Tsotsi (poor little hyena...!). You guys rock!! 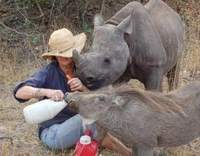 Thanks for adopting the rhino in Zimbabwe!! That is just the coolest thing you could do. I may start watching hockey and may have a new favorite team!! Thank you so much for your donation for Tatenda which we received today. We have just finished editing the video footage of Tatenda so we will post the DVD to Karrie Kern, our representative in the United States and she will deliver it to you soon. We would like to extend our heartfelt appreciation to you for your assistance in feeding Tatenda. We recently went to Johannesburg to bank your cheques and buy food for Tatenda. Thank you so much for your assistance. We are working on a report to circulate to our mailing list but in the meantime, we have inserted some photos of the delivery for your information. If you would like any of the photos in higher resolution, please let us know. Last month, we received funds from the El Paso Rhinos Hockey Team to buy more milk and game cubes for Tatenda but due to medical problems, I was unable to travel to South Africa to purchase the food. 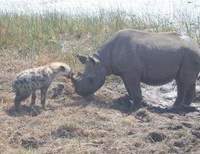 I discovered that game cubes are now available locally but I wasn't sure if the local cubes would agree with Tatenda so I bought 100kg, a relatively small quantity, and delivered it to Imire to see if the young rhino would approve before buying a full consignment. As it turned out, he wasn't very impressed with the local cubes and made it quite clear that he preferred the imported ones so I went to South Africa and bought 600kg of game cubes and 50kg of skimmed milk powder. We donated 100kg of the cubes to Bally Vaughan Sanctuary. 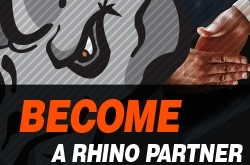 Thank you very much to the El Paso Rhinos and to the following people who have very kindly assisted us with funds: Lawrence and Sandy King, John and Helen Buckle, Rita Nichols, Charlie Thompson, Sue Ryan, Alan and Margaret Salmon, Candice Park Pearson and Pearl MacCallum. We were sitting in the garden at the Travers farm house, when Tsotsi the hyena suddenly appeared. He has grown so much that we didn't recognise him at first and my granddaughter leapt in a single bound onto the breakfast table. Tsotsi spends most of his time in the bush now and normally only visits the Travers in the evenings, looking for something to eat. We then went into the game park with our load of milk and game cubes to see Tatenda, Shanu and Hogwash. 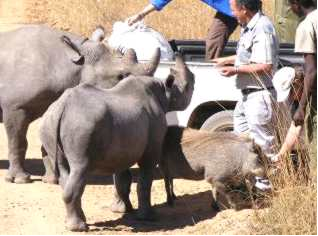 Judy opened one of the bags of cubes to give the 2 rhinos and the warthog a treat and they were delighted. There is no doubt that they know the difference between local and imported game cubes. Those of you who have been to Imire will know about the 3 elephants in the game park, the males, Big Mack and Toto, and the young female, Mandebvu. Last year, the Travers were making arrangements to have Mandebvu sterilized because she was reaching the age where she would start reproducing but before they had a chance to carry out the procedure, they discovered that she had beaten them to it - she was already pregnant. In May this year, Mandebvu gave birth to healthy little bull which the Travers have named Kutanga - meaning "first" because he is the first elephant ever to be born at Imire. Kutanga was 6 weeks premature. We saw him when he was only 2 days old and he was the tiniest little elephant we have ever seen. Judy kept the mother and baby in a boma for the first few days because she wasn't sure how the two bulls would react to the newcomer but when she released them into the game park to be with the other elephants, they accepted Kutanga into their family immediately. After visiting Tatenda, Shanu and Hogwash, we drove through the game park to see the elephants. The three adult elephants are very protective over the delightful little Kutanga and watch indulgently while he mischievously cavorts around, rolls in the sand and tries to charge everybody in sight. I'm sorry this has taken so long but there's been a lot of trouble at Imire and we weren't able to go there. I have attached a photo of me in the orange jersey standing with Tatenda. It is with great sadness that we have to report that our beloved Tatenda has passed away. 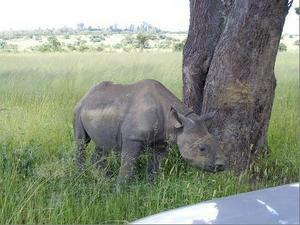 John and Judy Travers had saved him after his parents were killed by poachers. He turned into a very handsome young man. I would drive to Johannesburg 4 times a year, when he was a baby, to buy him special milk powder, antibiotics and teats. This little guy was so close to my heart and my family’s. My daughter even made him a rhino birthday cake for his first birthday. I remember Judy would sleep in his pen with him and take him on daily mud baths, one of his favourite activities. I would like to take this opportunity to thank John and Judy Travers for everything that they have done for him and for all the other animals in their care. 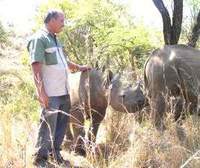 I have never seen such love and compassion shown or given to animals as these two give to all their animal family members…..
My dear friend Tatenda, rest in peace until we meet again….